This state-of-the-art Gastrointestinal title in the brand-new High-Yield Imaging series is ideally designed to let you quickly look up a diagnosis, confirm your suspicion, and move on to the next case. Renowned authorities, Drs. 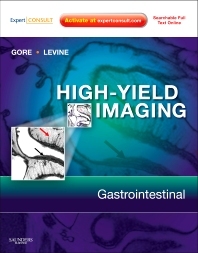 Gore and Levine, present 350 GI diagnoses, 1,200 optimally sized multi-modality clinical images, and at-a-glance bulleted text, to help you efficiently and accurately diagnose any GI disorder. A full-color design along with a consistent organization makes reference a snap. And, at expertconsult.com you’ll have easy access to the full text online as well as all of the book’s images for enhanced visual guidance. Features online access to the full text and all the illustrations from the book, with links to Medline, for easy referencing in the viewing room. Covers 350 GI diagnoses allowing you to diagnose a broader spectrum of conditions. Offers all the information necessary to provide referring physicians with the complete, actionable reports they need. Presents more than 1,200 optimally sized multi-modality clinical images to help you recognize the characteristic appearance of both common and uncommon GI disorders. Structures every chapter consistently to include Findings, Imaging Modalities, Clinical Presentation, Pathology, Incidence/Prevalence and Epidemiology, What the Referring Physician Needs to Know, Suggested Readings, and Selected Images to make reference fast and easy.